David showing off the new BBQ House – and Bar interior, set for the public the week of July 29. Several new restaurants on Newport Avenue are set to open while a couple of others are still works in progress. 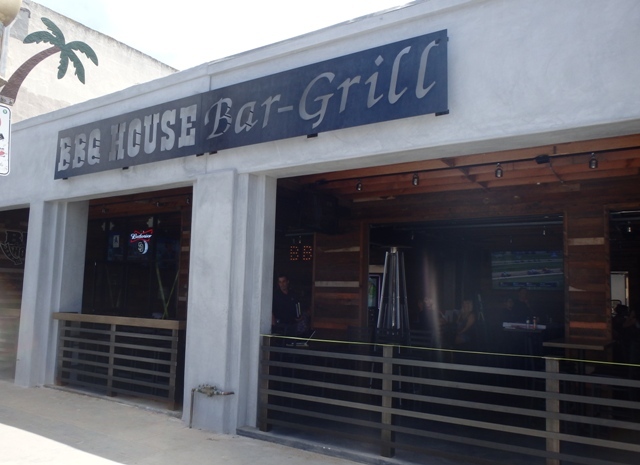 David of the BBQ House family, told me that the new expansion will open to the public this Wednesday, July 29th. Then they’ll figure out, he said, when the ‘grand opening’ will be. 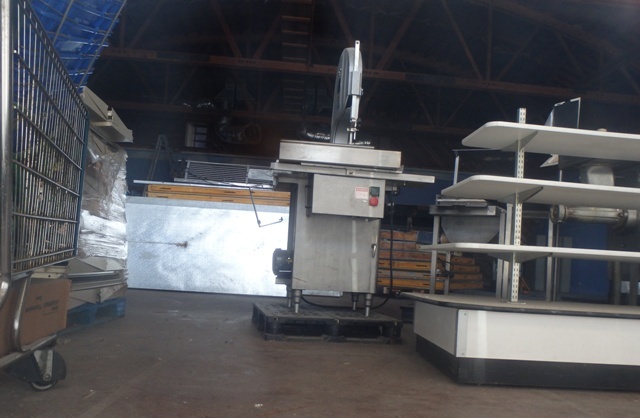 This has been a long haul for the family and its employees (and customers) as it’s taken 2 years to get this far. Servers and bartenders in training. 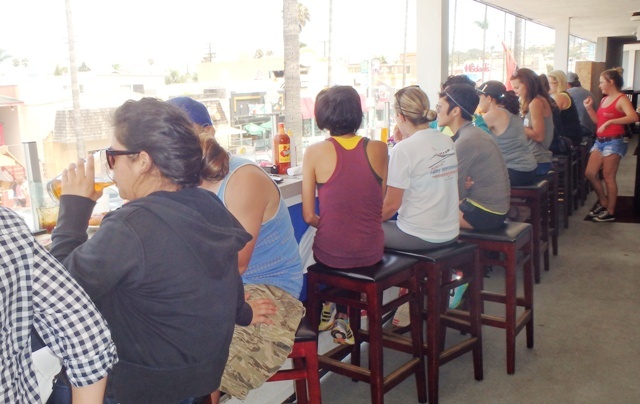 The day I was there – Friday the 24th – the place looked full – but they were all servers and bartenders in training. 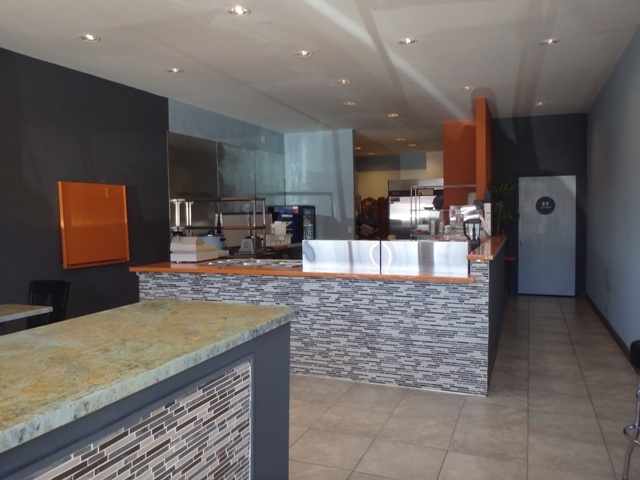 The expansion includes a new kitchen, a new bar and new eating areas both in and outside. Apple Tree Market not close to opening. The new Apple Tree Market on Newport has yet to open and by all looks and appearances, nothing much has progressed since our last visit. Interior of the coming market. 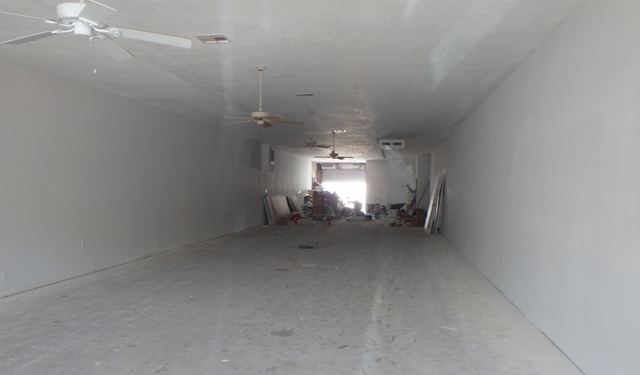 The new brewery – also years in progress – is much closer to fruition. The exterior has made a major stride in appearances. 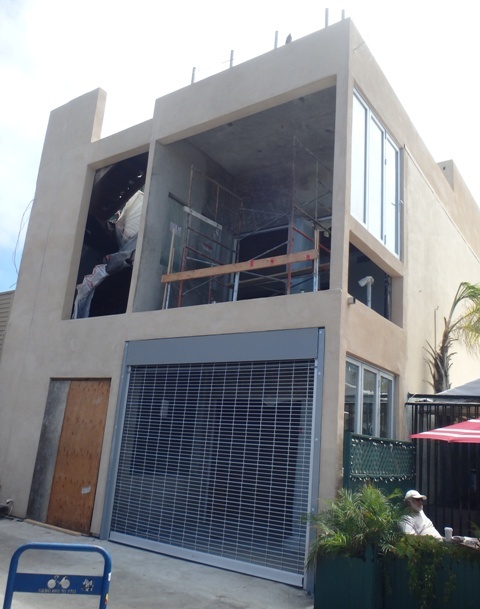 The new “OB Brewery” taking shape – on the outside. With the same owner as Newport Pizza across the street, the new place will be a brewery downstairs – the tanks and elevator are already in – and 2 levels of dining, including the rooftop. 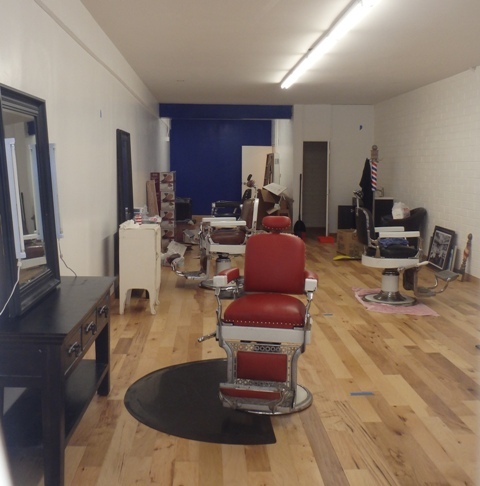 A peak at the interior – only half done, workers say. The current favorite name is “OB Brewery” but there is no opening date set, as I was told by several workers that the interior is only 50% completed. Pizzas will not be served here, as it will be more sausages and fine dining. 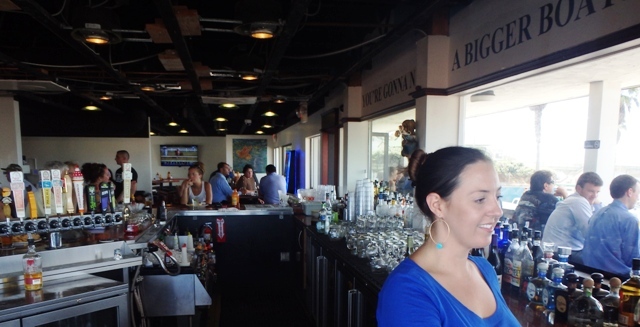 South Beach customers can now eat and drink overlooking Newport. 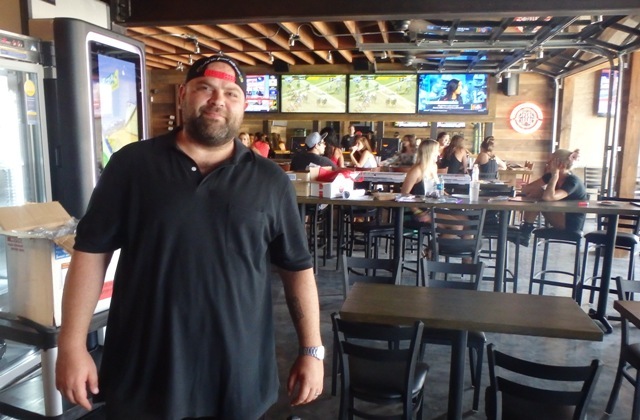 Major expansions have taken place at OB’s Southbeach Bar and Grill. The upstairs has taken off, with outdoors areas opened up, and the eating capacity enlarging – this all happened about 6 weeks ago, I was told by John Belmont, one of the managers on site. 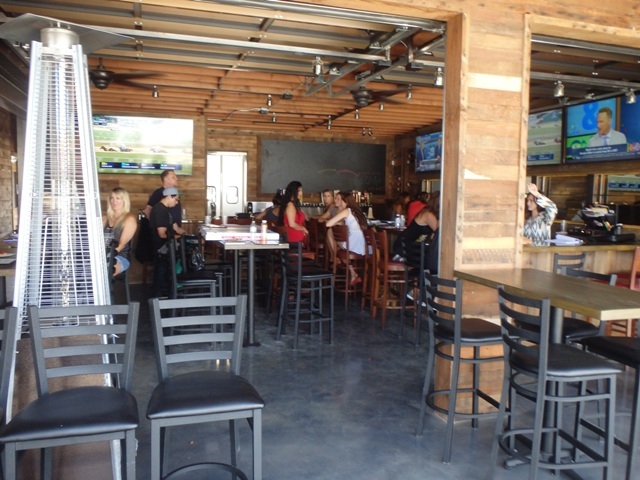 The upstairs has expanded for 62 new customers. All this has the looks of taking over the entire building, but more like 60% John said. 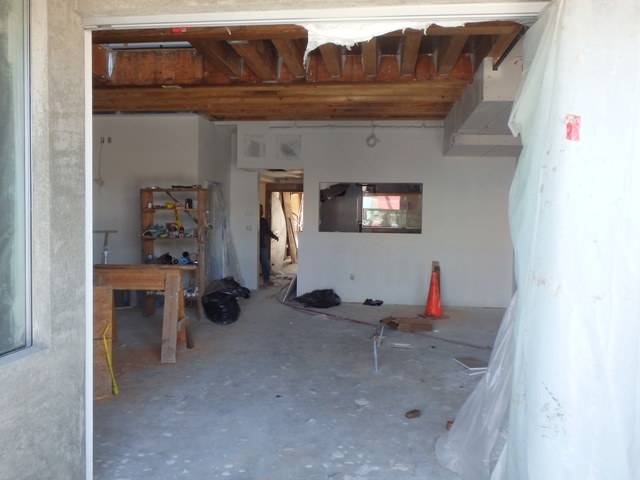 Hopefully, all this new expansion will allow the restaurant to expand its kitchen – which hasn’t yet. Maybe a new kitchen upstairs, John hinted. With all the newness, John explained, they’ve moved from a ’21-and-older’ establishment to be more family oriented and kids are now allowed in, Monday through Friday, up to 5pm. 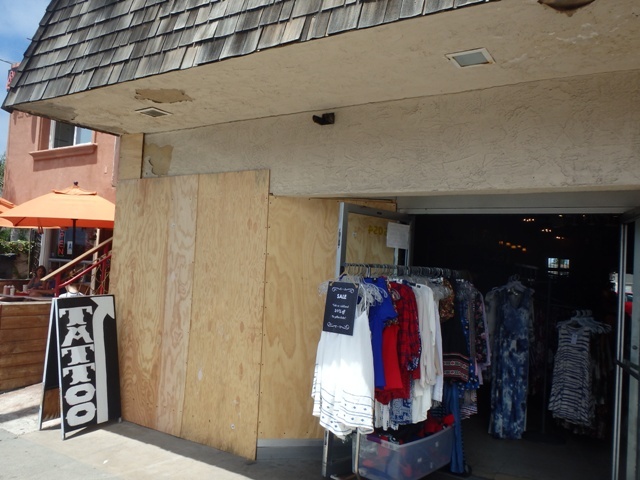 The women and girls’ apparel store is still in the dark with their broken plate window, taken out 2 weeks ago by an errant driver. 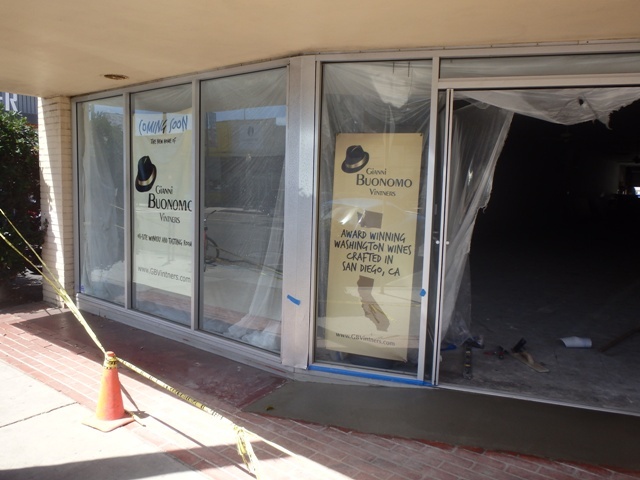 confirms the signs are announcing OB’s first winery is on it’s way, that Gianni Buonomo Winery and Tasting Room continues to deserve anticipation by OB’s growing wine crowd. After yoga, you’ll be able to walk next door to taste wine. Next to the in-coming winery will be a yoga studio. 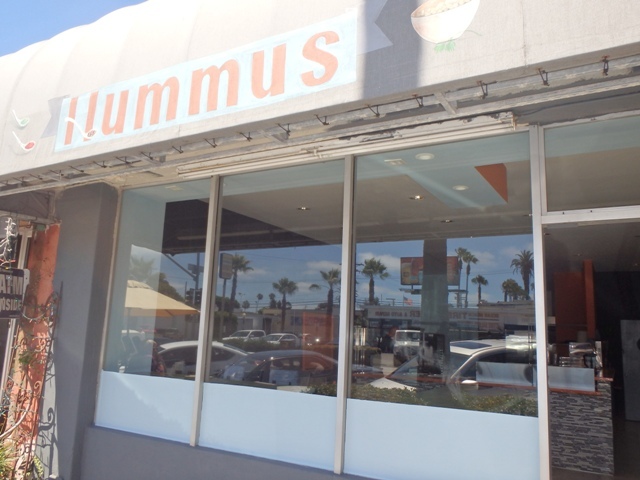 Another eatery that seems to be taking forever to open is Hummus, a Mediterranean restaurant getting very close, Sal, it’s owner told me. Camera-shy Sal said their final inspection is supposed to be next Wednesday, July 28. Interior at the new Hummus. He is all set to open except for the “sneeze guards” for his food displays, he told me. 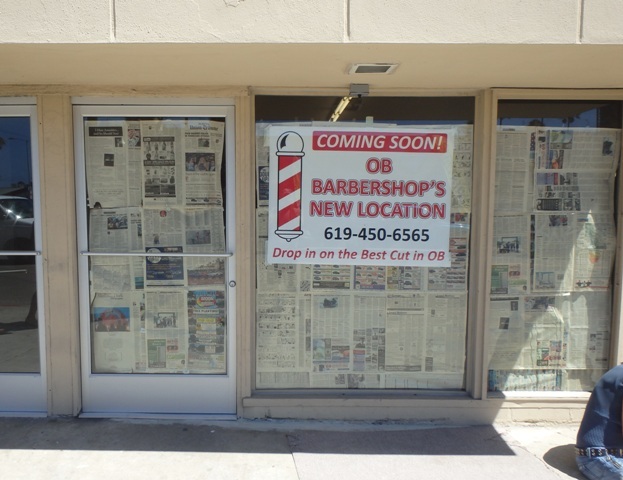 The OB Barbershop is moving closer to Newport Avenue from its Santa Monica nest and is moving in on Cable Street. The chairs appear to be in but we don’t know of any opening date. Well, folks, there ya have it. 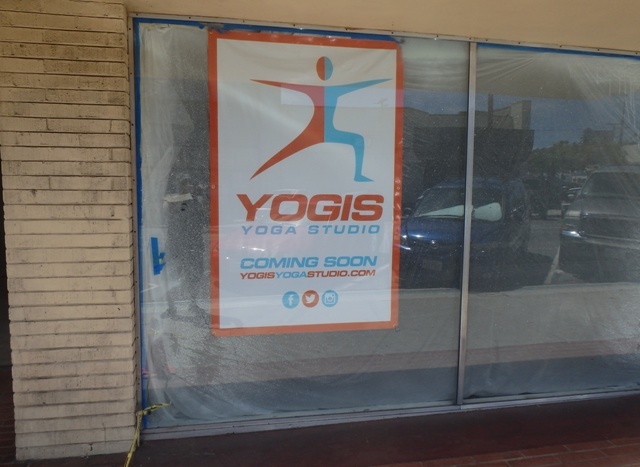 Another update on the comings and goings of merchants on Newport Avenue. If you enjoyed the cruise, hit the “like” button on leave a comment. Regarding the proposed opening of Apple Tree Market on Newport, I’ll believe it when I see it! I doubt it will ever happen. 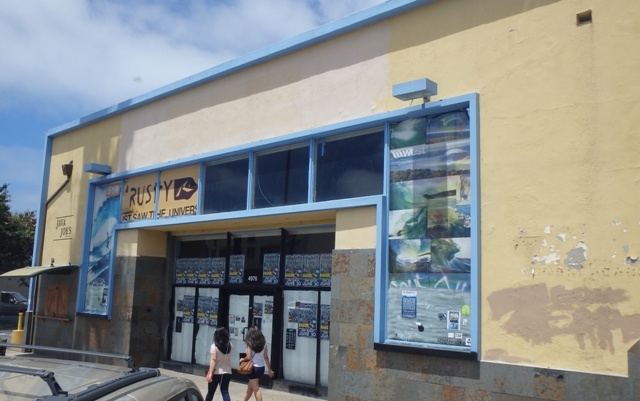 In the meantime, the building is an eyesore in the business district and Ocean Beach has been suffering for years from lack of a supermarket. I wish some new owners would take over this project. The old Apple Tree Market was a nightmare in terms of mismanagement and everyone hated shopping there. As much as I used to complain in the good old days when OB had TWO supermarkets (Mayfair and Safeway), I’d give anything to have even one of them back! I agree, but I don’t think everyone hated shopping there, but it was definitely convenient to go there & it served a great purpose for OB. I personally liked shopping at the old Apple Tree Market. It wasn’t a Vons or Ralphs, but it was good enough for me to get the groceries that I needed if I didn’t feel like driving. If rotten produce, moldy bread and expired products is acceptable to you, then Apple Tree was great. Sorry if you had a bad experience Christo. You can’t tell me every single produce, bread, & expired products were all bad. Like I said, it’s not a Vons or Ralphs standards. Of course not every product every time- but often enough to know that they did not take their jobs seriously. Multiple bad experiences over multiple years. And not just me- this was well know as Apple Tree’s standard in the 90’s. I’m not expecting artisian breads and deli service. I can even put up with the bad attitude from cashiers and managers who would be fired anywhere else if they were not family- but edible food a reasonable minimum expectation from a grocery store. Crapple tree failed on that front consistently. Thanks for all the updates, had no idea about most of them. Too bad Southbeach has the worst service ever. The expansion is great, but I’ve waited forever for drinks/food when the place is empty. When is South Beach empty ? Maybe it was closed. Actually I’ve experienced slow service at nearly-empty restaurants quite often, but I’ve been at South Beach only when it is almost full-up and the service was always quite acceptable, and the food was really good. yea no complaints about the food. We were in there on a random weeknight and there was seriously nobody there, and our drinks just sat and sat and sat on the bar 10 feet away while our waitress was talking near the back with the other employees. My wife (who is in the industry) finally just got up and went over and got our drinks. That was an isolated incident I believe. We also go there every Thursday before our softball game, and they are understaffed (this was before the reno, we’ve stopped going there because it always takes so long to get helped.) I understand it’s busy, I don’t have crazy high expectations, it just hasn’t been very good. I agree with the above commentor… Apple Tree was HORRIBLE! It was good for buying canned foods and maybe an onion or something, if I happened to forget a crucial ingredient from a real grocery store. They took no pride in offering quality organic food to the community. I hope they never reopen.